Dolphin supply and install a diverse range of hoists made by the world's best patient lifting manufacturers. We specialise in bespoke hoisting solutions. Dolphin supply, install and maintain a wide variety of hoists and patient handling equipment, including ceiling hoists, gantry hoists, portable hoists, wall mounted and mobile hoists. We also employ our own local engineers so that we can provide an excellent service after your hoist has been installed. Dolphin are approved suppliers for several of the world's leading hoist manufacturers including Arjo Hoists , Oxford Hoists, Liko Hoists, Molift Hoists and Joerns Healthcare. We are also delighted to be the UK distributor for Handi-Move International. There are many advantages to using a ceiling track hoist for both the carer and the person being lifted. A freestanding gantry hoist has the appearance of a football goal. There are two upright posts and a crossbar. Most Gantry Hoists can only be used with a portable motor which is hooked onto a trolley than runs along the rail. The Handi-Move Freedom Bridge is an exception as you can fit any of their ceiling hoists to it, opening up the possibility of using a powered traverse motor on a gantry system. Dolphin supply many types of mobile hoist depending on the users lifting requirements. Some versions fold down or can be easily taken apart in order to transport the hoist between locations. Mobile hoists can be difficult to move around the room, so they're fine to use on hard floors or thin carpet but they're not appropriate for use on a deeper pile. If you use paid for carers they will insist that two carers are used if you are transferring a person with a mobile hoist. A Bariatric Hoist is capable of lifting someone that weighs over 30 stone. There is a growing need for Bariatric Hoists as the average weight of the world's population rises. The only floor hoist that can lift high enough to hoist a person onto a full size trampoline is the Victor 2600. It is often used where there is a need to lift a disabled person onto an above ground trampoline for rebound therapy. We also have solutions for transferring people onto sunken trampolines but this requires a socket to be installed into the ground because regular floor hoists can't swivel over a sunken trampoline bed. 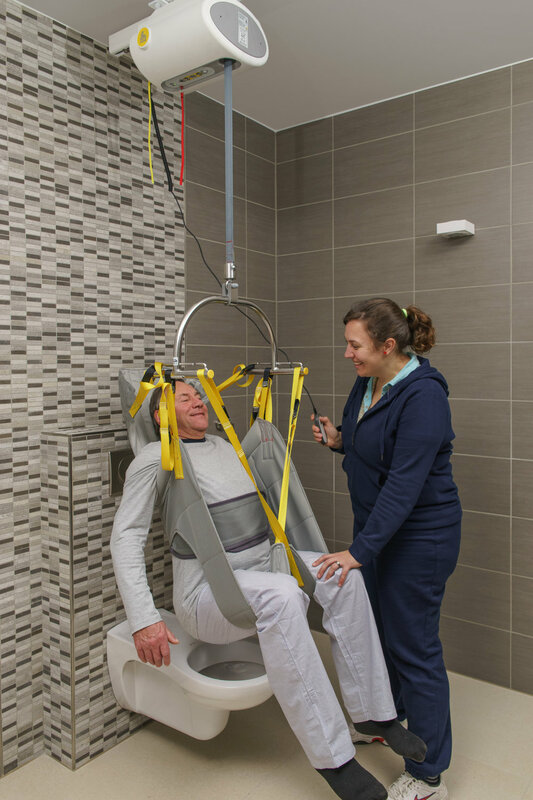 We have found the Handi-Move wall lift and seat sling to be the best solution for people that want to continue enjoying a proper bath. It is unique because it reclines to assume the form of the bath. Most other bath lifts and hoists use a seat which inevitably takes up a lot of room in the tub.